Today is the day for the Taylored Expressions March Release!!!! You've seen so many beautiful projects this week from the Baker's Dozen team and now you get to purchase all of the sets and dies! Head on over to the TE Blog or TE Store... BUT FIRST, take a peek at what I made to share today! My first project uses the stamp set called Graphic Greetings - Mom along with the pretty butterflies from the In Flight Overlays dies. I used the Pebbles 6x6 paper pad called Yours Truly for all of the pattern paper. I stamped the image in white pigment ink and then heat embossed it with white embossing powder. I let the image sit for a few minutes to dry, and then used the Pages & Pockets 3x4 Essentials dies to trim out the frame in the cherry red color and also in the rose image. I used 3 coordinating papers from the Yours Truly paper to cut out the butterflies and then added rhinestones to the centers. May Arts seam binding, floss and a matching button finished off the card. For my second project, I used the new Bloom Where You're Planted Dies and a portion of the sentiment from the Big Bold Thanks stamp set. Everything from the flower pot, stems, flowers and flower centers were are all dies in this set. 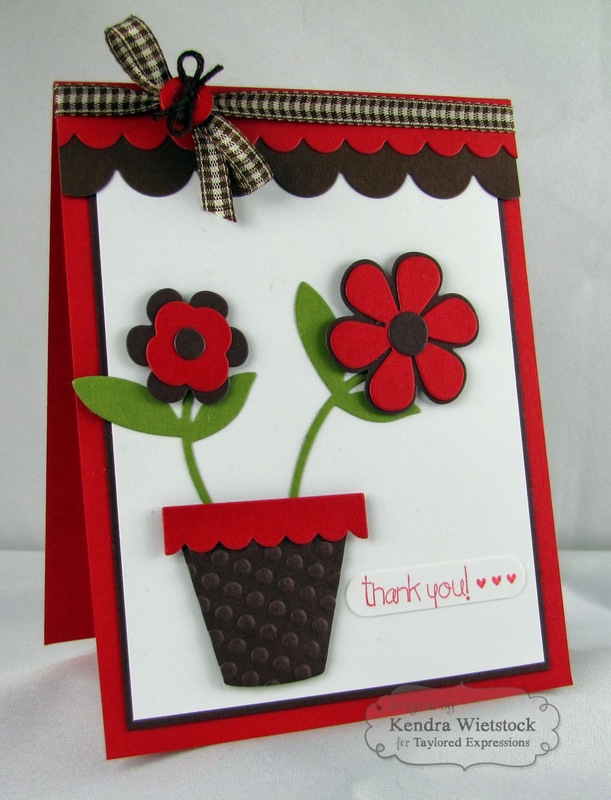 I embossed the flower pot with my polka-dot embossing folder from my stash for some extra texture. I also added trim at the top of my card using both the Small and Medium Scallop Border Dies. A little bit of gingham ribbon and a red button finished off the card. Now it's time to hop along and see what everyone made! Then make sure you stop by Taylored Expressions to order your next goodies! Gorgeous - love them both - love the bright colors! Taylored Expressions and Simple Stories Team Up! Creative Cafe Kit ~ Fancy Hat! Crafter's Companion & QVC Samples!